Police fire teargas shells outside IMA market in Imphal on Sunday. 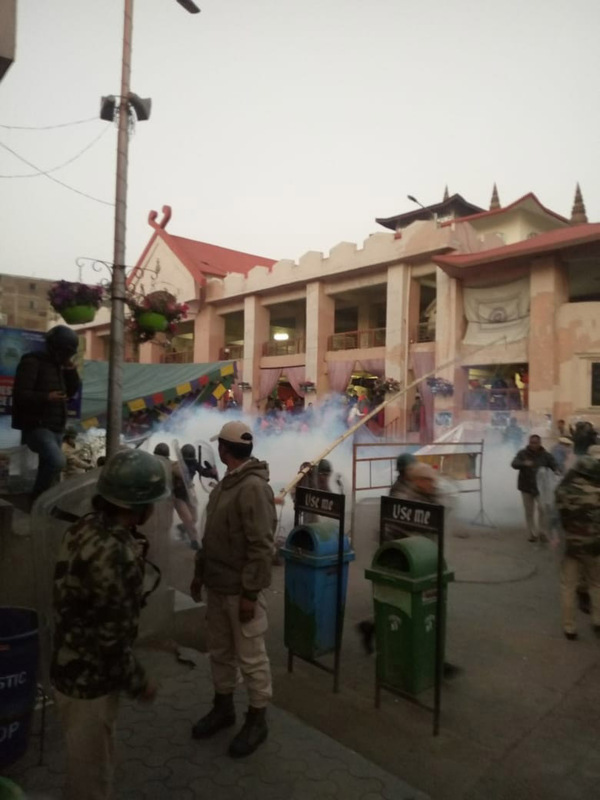 IMPHAL: Six women, mostly above 60 years, were injured in police firing at the Khwairamband Keithel, the main market of the state, on Sunday as protesters slept on the streets to protest the Citizenship (Amendment) Bill. The protesters, mostly women, were refusing to return home as they opposed the decision of the Prime Minister Narendra Modi to pass the bill. Police came in large numbers and fired tear gas shells and attacked them. One of the injured, who is 68-years-old, is being treated at RIMS along with the other women. The women shouted slogans against Narendra Modi and BJP. They shouted, “down down BJP” , “Stop Modi from destroying people of North east” etc. All the clothes, carpets, brought by the women to sleep on the streets were also taken away. The situation was tense as large numbers of women were injured and hundreds of people came out to support the women.